The yard described the new model as "tough and robust"
The 29 metre is the second model in Lynx Yachts’ Adventure series, joining the Adventure 32. The design brief for the Adventure 29 called for a world cruiser that could explore exotic destinations but was robust enough to withstand tough conditions at sea. The result would be a yacht that could go anywhere in any weather. Featuring a contemporary profile design by Bernd Weel, the yacht takes inspiration from the styling of the Lynx YXT support vessel series. At sea, rigid, high bulwarks above a strong vertical plumb stem bow are able to power through heavy weather with ease. Meanwhile, naval architecture by Diana Yacht Design consists of a wide 8.2 metre beam and a shallow draft to allow the yacht to access hard to reach destinations, as well as helping to reduce fuel consumption. 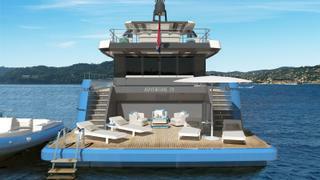 Plus, a wide beam also means there’s plenty of space for lounging and relaxing on board. The vast sundeck features two areas parted by a retractable glass wall. Forward there are sunbeds and a Jacuzzi with a swim up bar - the perfect spot for spending sunny afternoons - and aft there’s a lounge and dining area for al fresco meals and evening cocktails. One star feature is her enormous beach platform. At the stern there’s space to store jet skis or tenders up to 6.5 metres. But, once the tenders are in the water, the area transforms into an impressive 30 square metre bathing platform for easy access to the sea. When it comes to layout, the wide beam developed for the Adventure 29 creates new opportunities never seen before on a yacht of similar length. The main deck saloon is a bright area, completely free on three sides, with full-height glass surfaces, a bar, and a double sliding door bringing the outside in. 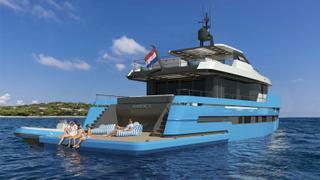 On the lower deck, the yacht can sleep up to eight guests in four cabins, including a capacious full-beam owner’s suite with a walk-in-wardrobe, a VIP cabin and two convertible doubles. 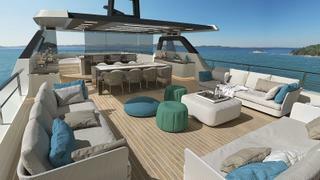 A flexible cabin arrangement makes the yacht ideal for families and chartering. All cabins have en suite bathrooms and there is additional accommodation for four crew. The Adventure 29 is a robust and capable yacht designed to reach even the most remote destinations, and is perfect for those wanting to explore further afield.